The Velebit hiking route passes through the Ramino Korito old-growth forest. Two unique forests in the Rewilding Velebit area in Croatia were recently added to the UNESCO World Heritage List. Benefiting from additional protection, they comprise 1300 hectares of beech forest in the Northern Velebit National Park (in the Hajdučki and Rožanski Kukovi reserves) and around 2030 hectares of forest in the Paklenica National Park (in the Suva Draga – Kliment and Oglavinovac – Javornik areas). The new designation was based on the forests’ originality, geographical position, age and size. One more forest in the Rewilding Velebit area may soon be added to the list of Croatia’s protected areas. 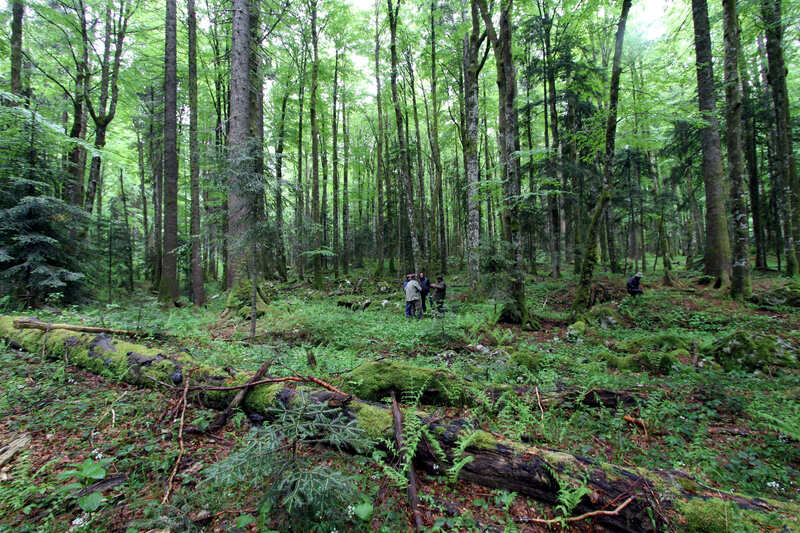 Cooperating with the University of Zagreb’s Faculty of Forestry, the Rewilding Velebit team have now completed a project to establish the scientific basis for designating the Ramino Korito old-growth forest a unique woodland reserve. 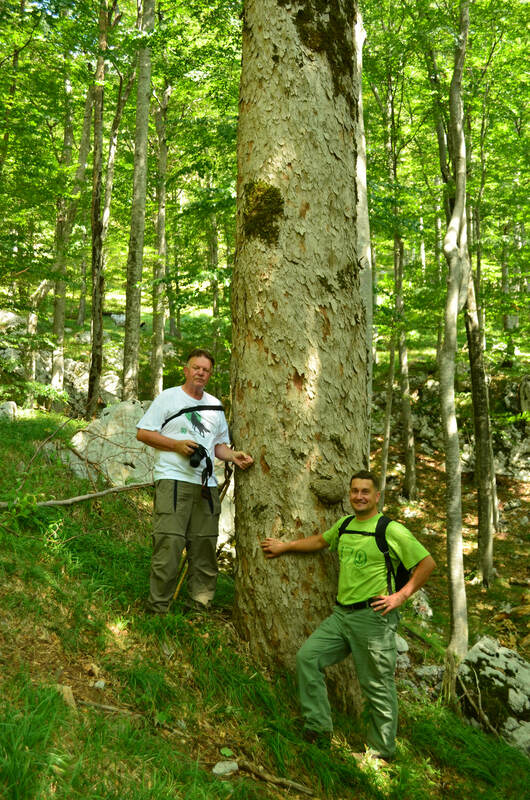 Professor Joso Vukelić (left) and his colleague Stjepan Mikac (right) in Velebit rewilding area. 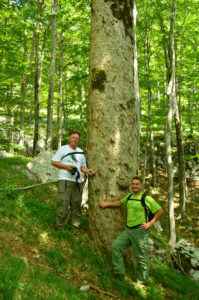 Nera Fabijanić, the Rewilding Velebit communications officer, recently caught up with Dr. Joso Vukelić, a professor at the University of Zagreb’s Faculty of Forestry, to ask him a few questions about European old-growth forests, and how Ramino Korito is set to benefit from the research team’s work. What exactly is an old-growth forest, and how common are they in Europe? There are several definitions of the term old-growth forest, but they are commonly held to be natural forests that have continually and naturally developed without direct anthropogenic influence. This is a stable forest with balanced dynamic relationships between its individual constituent components. An old-growth forest is also considered a natural forest with little influence from the local population – Ramino Korito is one of these. In the past it was used for travel between the sea and the Lika region of Croatia, and the Velebit hiking route still passes through it. Old-growth forest complexes in Europe are rare, accounting for less than 0.5% of total European forest area. What is the procedure for declaring a forest a special reserve? 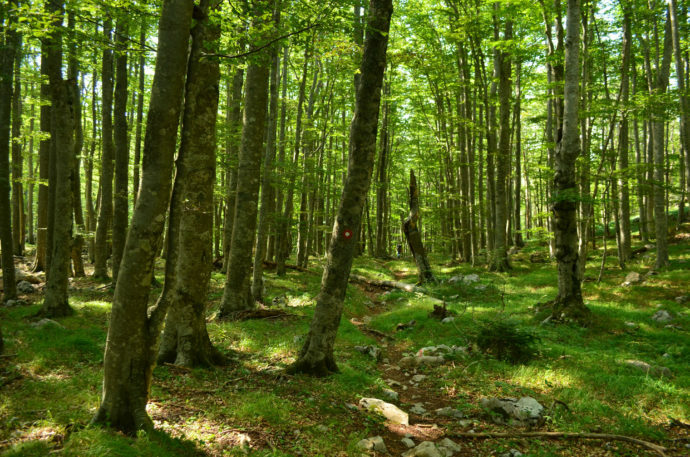 Croatia’s Ministry of Environmental Protection and Energy decides which forests can be declared special reserves, mostly based on scientific proposals from professional institutions, individuals and associations. We have now established the basis for such a proposal for the Ramino Korito forest. According to the Law of Nature Protection from 2013, a special reserve is an area of particular importance because of its uniqueness, rarity or its population of endangered species. In Croatia, 80 reserves are currently protected, of which 36 are forests or woodlands. 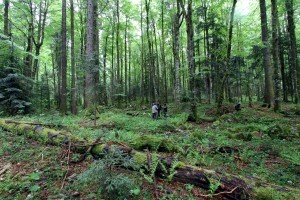 How will the Ramino Korito old-growth forest benefit by being made a protected reserve? The designation of a forest as a natural reserve guarantees its survival in such a form as it is now. On the other hand, activities to maintain or improve conditions that are important to preserve the reserves are allowed. The designation draws attention to the exceptional natural rarity and value of the area, directly affecting the number of visitors, economic and other benefits for the local population. In the world there are numerous examples of a multiple increase in the number of scientists, experts, hikers, tourists and other visitors to areas included in the UNESCO list, the NATURA 2000 ecological network, the Ramsar Convention and so on. Fieldwork by project team members from Rewilding Europe, Rewilding Velebit and Faculty of Forestry in the old-growth forest Klepina Duliba, Velebit rewilding landscape, Croatia. Why was Ramino Korito chosen for this research? Are there any other similar forests in the Rewilding Velebit area? The Ramino Korito complex has all the features of an old-growth forest: there are no traces of economic activity, large trees and all the growth phases of a natural forest are present, it is isolated from human settlements, the infrastructure is untouched, and the floral composition is made up of the autochthonous species of herbs that typify Dinaric beech forests. These forests are amongst the richest floristic beech forests in Europe. The area of the Ramino Korito old-growth forest set for designation covers 265 hectares; this is an important ecological hotspot in the growing network of protected forests in the Rewilding Velebit area. We already have Paklenica National Park and the Northern Velebit National Park, the nature reserves of Hajducki and Rožanski Kukovi, and the Klepina Duliba special forest reserve, which is more widely known as the Štirovača old-growth forest. There are also the Smrčevi Dolci and Borov Vrh special forest vegetation reserves in North Velebit. We are exploring some more old-growth forest stands this year. All the latest scientific discoveries indicate that they deserve protected status and may be declared special forest vegetation reserves by the end of this decade. It will be a major achievement of Rewilding Europe and the Wildlife Association of Velebit (Udruga Divljina Velebita) if we are able to preserve, protect and promote the natural values of the forests of the Velebit Mountains. I welcome the addition of the beech forests of the Northern Velebit National Park and Paklenica National Park to the UNESCO World Heritage list, especially in the context of what I have just mentioned. In summation, the formal approval of Ramino Korito as a special reserve will show that Croatia’s beautiful natural places are being managed and protected in the best possible way for future generations, while simultaneously enabling the socio-economic development of regions where parks are located. By increasing the number of visitors, without jeopardizing the natural beauty of these areas, we are also showing that it is possible to create new sustainable business opportunities based on the natural values of the region. This all contributes to the overall rewilding initiative in the Velebit Mountains.